Comments To Machinist (CTM) are words and lines added to a drawing to describe a feature that cannot be modeled directly or to clarify something needed in a design. Draw lines and/or text using the left toolbar. Draw an arrow when a CTM applies to a specific area of the drawing. Choose Line | Machine | Comments to Machinist. 3D shapes that cannot be modeled in the CAD software. Advanced threading requirements not supported in the interface. Countersinks in 2D designs – specify angle and size per the diagram at CAD menu Line | Machine | Chamfer. High quantity of repetitions of a hole or shape in order to avoid long computations. For injection molding, to show the desired location of the parting line, gate and ejector pins. Special finishes including special colors or multiple finishes. Sometimes you can reduce cost by designing a single shape that is then sawed apart to create two more more parts. To do this, show the location of sawing using comment lines and add text such as “Saw apart here”. But note that the position of sawing is about +/- .05 and the blade kerf removes about 1/8″ of material. Use this method only for simple shapes such as a bar and don’t create weak links between parts that make machining difficult. 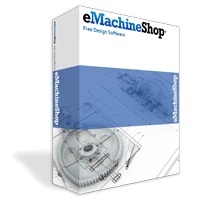 The eMachineShop CAD is able to model an infinite variety of complex shapes — but not all possible shapes. The CAD was designed to allow modeling of shapes that can be machined by relatively economical processes. Shapes can include complex curves but not those involving cutter movement in 3 axis simultaneously. For example, eMachineShop CAD cannot model or machine a person’s face, a tree and most living things. Holes and other features that must be machined from angles not orthogonal to one of the six views. Edge shapes other than chamfer or round. To show holes and other features at angles other than the six normal views, model the hole using normal CAD lines if possible and add comment text and lines in side views to clarify the desired angle and position. If needed cross reference as in “See A in Left view”. Use CAD features to accomplish shapes whenever possible before using Comments to Machinist. The cost associated with your comments is determined manually by the eMachineShop staff upon receipt of your order, your approval being requested if the charge exceeds $25. In some cases Comments To Machinist can reduce price – for example if you instruct to omit certain machining. Pricing is not provided prior to placing an order, however you can decline to process an order if the charge exceeds $25. Next to your text it is often helpful to draw an arrow to point to what the text refers to (unless it is self evident). In some cases you may need to clarify a comment by referring to another comment in another view (e.g. “See A in Top view”). “Leave some parts not bent” is unspecific. “Don’t bend 10 parts” is specific. “Exactly 1.000” has no tolerance. Use “1.000 +/- .005” or whatever the desired tolerance range is. Instead of “Second hole must be one inch from edge”, use ext with an arrow pointing to the item. Avoid references to stock components such as “Make .005 larger than McMaster bolt # 123456.” Instead, review the drawing of the bolt and design your part with appropriate clearance and tolerance. Writing clear comments can be a challenge. Often comments are clear to the writer (you) but not to the reader (the machinist). You want to create clear and unambiguous comments to be sure to get the part you need and avoid paying for a second order. So how can you tell if you wrote clearly? Try to write clearly and follow the commenting tips. Get a friend, relative, co-worker or even a random person to read your comments and look at the 3D view. Ask the person to explain in their own words in detail their interpretation of what you wrote. Ask any specific test questions you can think of (e.g. “According to your understanding would you tap the .25 diameter holes?”). If their understanding is as you intended you are likely in good shape. If their understanding is confused or not as you intended DO NOT EXPLAIN WHAT YOU INTEND AND DO NOT DEFEND YOUR WRITING. Instead rewrite your comments and go back to step 1.